Attractive open main lounge area overlooks the lovely rock swimming pool – a perfect place to relax on hot summer’s days! We love the romantic bath tubs on the private decks of the tents – enjoy views out on the bush whilst enjoying a lovely soak! Unfortunately, no children under the age of 12 are accommodated here - but on the other hand for the more romantic couple this makes it a lovely quiet retreat! Chapungu Luxury Tented Camp lies in the heart of the Thornybush Nature Reserve, a reserve which has earned its reputation as one of the country’s finest bush experiences. 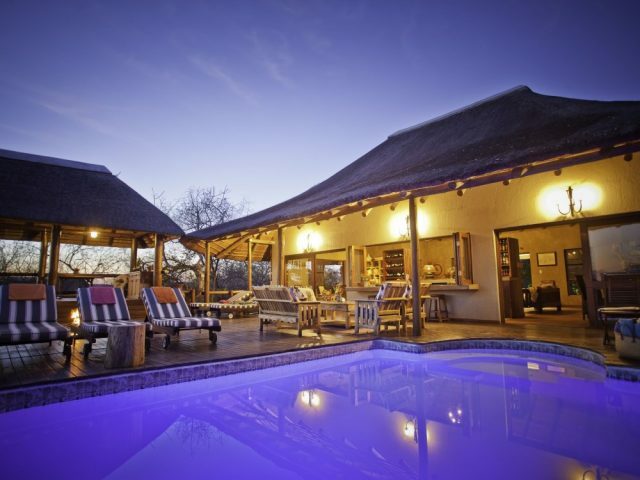 Situated adjacent to the Kruger, this 14 000 hectare reserve, the Thornybush offers a true escape from the madness of city life! Here a diversity of wildlife and bird species can be found across the diverse habitats, ensuring a memorable safari experience with plenty to see and do. 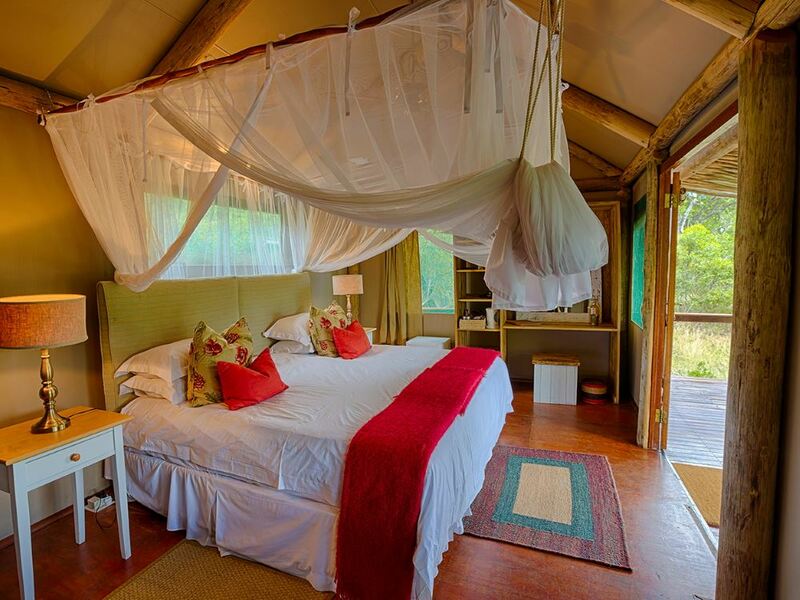 Washed with the warmth and colour of the afternoon sun and in true African style, the 8 tents at Chapungu enjoy a lovely bushveld setting. When we say “tents” don’t get the impression that these are the type of rickety affairs that used to collapse on you at the first sign of a rain shower or slight breeze back on those long forgotten childhood camping holidays with your annoying cousins! Instead these are substantial, spacious and comfortable affairs (indeed they’re pretty luxurious!) that have been tastefully furnished in colonial style and equipped with en-suite facilities including outdoor showers. 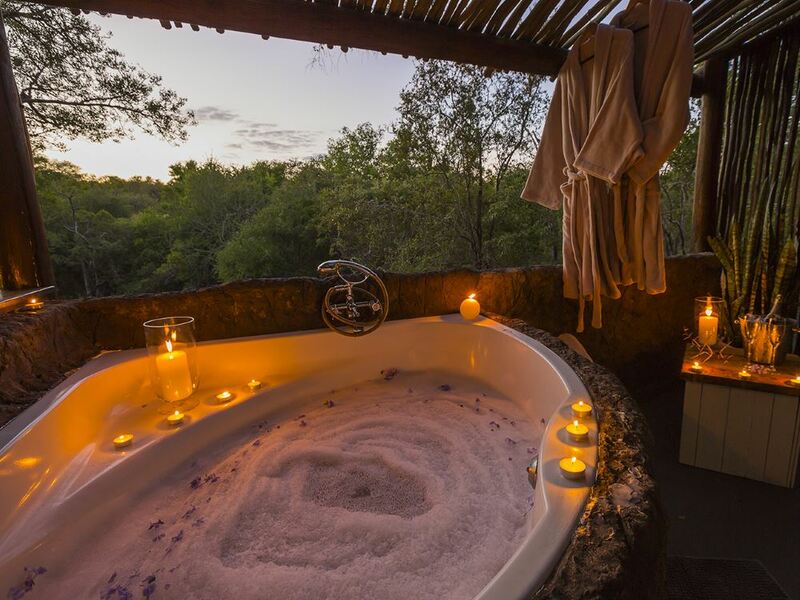 The highlight though has to be the gorgeous feature bushveld baths on your private deck (there’s nothing like luxuriating in a piping hot bubble bath whilst eye-balling one of the resident bushbuck!) For extra comfort, there’s a ceiling fan and air-con which are wonderfully welcome during the heat of summer. All in all the tents are actually an adventure in themselves and the experience of really being in the bush strikes you when you open your door to see friendly warthog grazing just in front of your tent or curious monkeys playing in the trees nearby. And should you be woken up at night with lions roaring nearby, there’s no doubt that an extra tingle of adrenaline is going to go coursing through your veins! 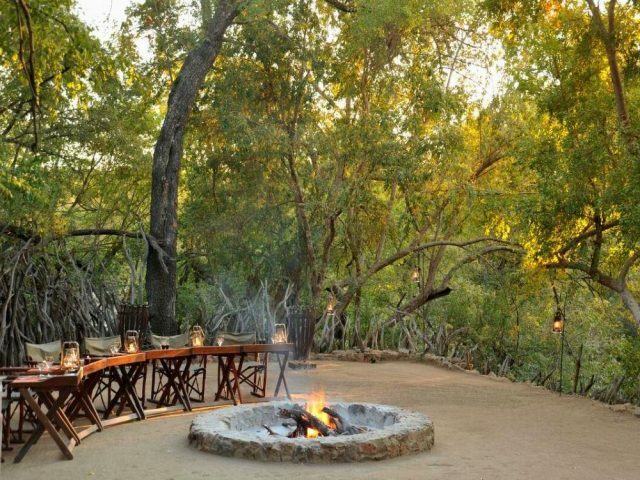 The tents are connected by pathways to the main camp which again bears all the hallmarks of a classic African safari lodge with its large thatched living, dining and bar area which opens out onto a wooden deck which includes a unique rock pool beneath a canopy of trees. This is the perfect place to relax during the heat of summer afternoons as you take a dip in the rock pool with an ice cold beer whilst checking out for game in the surrounding bush as you enjoy the cooling waters. If that’s not relaxing enough, then head over to the gorgeous Amani Spa situated at nearby Thornybush Game Lodge for a pampering massage or beauty treatment. The main camp also boasts a well-stocked wine cellar and curio shop. Dinners are an occasion and an opportunity for you to recount the excitement of the day’s game viewing experiences either in the dining area or the boma around a log fire accompanied by the night sounds of the bush before retiring to the lounge for a night-cap or the comfort of your tent. But it’s the bush that is the real star here, and you’ll enjoy great game experiences in both open Land Rovers, and on foot. The Thornybush reserve is home to an abundance of species: 147 mammals including the "Big Five", 114 reptiles, 507 birds, 49 fish, 34 amphibians and 336 trees. The reserve is predominantly open savannah and enjoys a near perfect year round climate The difference between a private reserve like this versus a national park will be revealed in your game viewing experience – you’ll see it clearly in your first lion sighting where you’ll be able to get up close and personal with big cats that are relaxed in the presence of the game vehicles and where you’ll only have 1 other vehicle with you at any sighting – quite a contrast then to the battalion of cars jostling for front row that you so often experience in the public parks! You will also be accompanied by experienced rangers and trackers who will share their extensive knowledge of the bush and love to traverse off-road to follow animals! You may be invited out of the vehicle to see tracks, examine certain plants or follow spoor to see what the animals have been up to during the evening. The more adventurous are encouraged to join ranger and tracker on a bushveld walk as this allows you to see some smaller creatures as well as the opportunity to learn more about the flora and fauna – or follow footprints in more detail! The Shangaan trackers will entertain you with their explanations of the medicinal and other uses of the numerous plants and trees along with tales of traditional folklore. And if you are lucky enough to come across big game on foot, then the thumping of your heart will remind you that the bush is a place where you truly feel alive! Family-run with 5 tented rooms and gorgeous deck overlooking a waterhole - a wonderfully personal bush experience if you aren’t too fussed about luxury. Community-owned lodge with 12 gorgeous tented rooms - wonderfully warm and hospitable staff and great value for money!